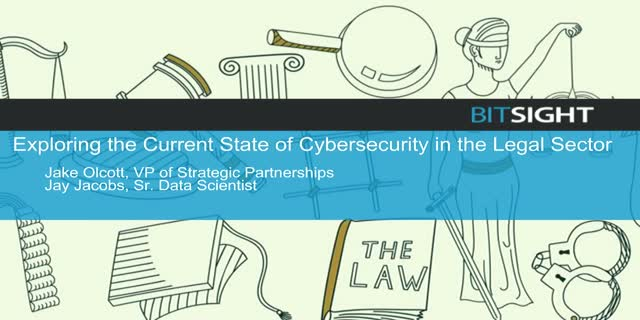 Despite the fact that third party breaches have been on the rise, organizations may not be doing enough to manage the cybersecurity of all of their critical vendors. Law firms, in particular, are one of the most widely used third parties, yet the Legal sector may be getting overlooked in vendor security discussions. In fact, the latest BitSight Insights Industry Index report revealed that although companies in the Legal sector have high security ratings and low rates of vulnerabilities, the industry remains a key target for cyber criminals. Therefore, it’s crucial for organizations in this space to understand their cybersecurity posture and improve their vendor risk management techniques. An increasing number of data breaches begin with the compromise of a key vendor or business partner. This was evident with the spread of NotPetya ransomware this past June, which highlighted to the world the importance of updating systems within corporate networks to prevent susceptibility to breach. Now more than ever, it’s critical that organizations are aware of both the vulnerabilities within their own networks and those within their supply chain. - The security performance of over 5,200 Legal, Technology, and Business Services companies monitored by hundreds of Financial Services firms on the BitSight Security Rating platform. - BitSight’s research on botnet infections, outdated systems, and peer-to-peer file sharing within the Financial Services industry. - Best practices for managing third-party cyber risk and analyzing weak links in your supply chain. - BitSight’s own research on outdated endpoints and their correlation to the May 2017 WannaCry attacks. - Cybersecurity trends shown throughout the year, and their implications on the nature of the incidents we can expect in 2018. - Recommendations for creating a strong security strategy that proactively mitigates risk within your organization and across your supply chain in 2018. Learn more about the breadth and quality of BItSight's data. Benchmarking has been a cornerstone of business for years. By benchmarking different functions of business, from HR to customer service and finance, businesses can compare performance against their industry and peers. So why not benchmark a company’s IT security performance? Watch this video featuring BitSight CTO Stephen Boyer to learn how businesses can leverage the data provided by Security Ratings to effectively benchmark security performance against an industry or peer organizations. How do you and your third parties perform? BitSight's Portfolio Quality Dashboard can tell you. Hear how TransUnion's Jasper Ossentjuk developed a future-forward vendor risk management program by using BitSight Security Ratings to translate complex cybersecurity issues into simple business context. Learn more about the BitSight Discover product. Organizations continue to outsource critical operations to third parties. As a result of this trend, security ratings are quickly becoming a key component of effective vendor risk management (VRM) strategies. Although Boards of Directors and senior executives are interested in their organization’s security posture, information security and risk management teams often lack the necessary information to help them understand details and clearly communicate about the aggregate risk of their vendor ecosystem. Join us as Rebecca Ruiz (Principal Advisor, IT Cybersecurity & Compliance, Southern California Edison), Tom Stumpek (former CISO and CIO, General Electric), and Joel Alcon (Product Marketing Manager, BitSight) discuss best practices for reporting metrics to senior executives around vendor risk management performance. - Southern California Edison’s methods of effectively reporting their vendor risk management program performance to their cybersecurity oversight group. - An executive perspective on the “do’s and don’ts” of successfully presenting your organization’s security posture through metrics and beyond. - Proactive ways to mitigate third party risk. As the complexity of cyber attacks grows, healthcare organizations are keenly aware of the sensitive data that is at the heart of their businesses. Healthcare companies must remain vigilant about their security posture as well as the security of their third and fourth party vendors, especially as patient data continues to migrate to digital systems. - The biggest security challenges facing the healthcare industry today and proactive ways these organizations can mitigate cyber risk. - How MultiPlan effectively reports on their security and vendor risk management programs to their Board of Directors using security ratings. - How MultiPlan has established a scalable vendor risk management strategy that fosters collaboration between MultiPlan and its trusted vendors. - The checklist organisations should review to align their business with GDPR. - Noteworthy articles within GDPR and how they affect data governance/usage. - BitSight’s recommendations for monitoring the GDPR alignment of third parties. Learn more about the BitSight Security Ratings product. This past May, over 300,000 computers in over 150 countries were affected by the WannaCry ransomware attacks. Despite an available patch from Microsoft, many of the companies failed to install critical updates prior to the attack-- leaving them vulnerable. Thousands of machines were infected and the worm caused network outages, flight cancellations, and ATM failures. - The evolution of vendor risk management and the increasing importance of investment in cybersecurity programs to monitor and mitigate emerging threats. - A breakdown of the Fortune 1000’s security performance according to BitSight researchers. - BitSight’s recent research on data breaches, especially the correlation between ransomware attacks like WannaCry and outdated systems. - The value of continuous monitoring with security ratings throughout the vendor lifecycle. As business success grows more reliant on data, technology, and third parties, CISOs and security leaders are finding themselves more often in the spotlight. They're being asked to brief board members, respond to third party requests, guide critical decisions, and make tough strategic calls. These increasing expectations are creating great opportunities for CISOs to shine, but to do so, they need to rise to the occasion. This webinar takes best practices and lessons learned from "superstar" CISOs, explaining what top security leaders are doing to lead their companies successfully through some of today's most complex business and technology challenges. In the aftermath of the recent NotPetya/ExPetr cyber attack that spread across Europe, Asia and the US in June, what are the lessons for enterprises and organizations? How should we improve our critical data security in an age of high-frequency and high-impact cyber attacks? Large-scale data breaches continue to hit all industries, leading to millions of compromised records. According to the Identity Theft Resource Center, there were 780 data breaches in which nearly 178 million records were compromised. While no industry is immune to data breaches, some are more prepared than others. In today's world, a cybersecurity incident can quickly become a risk to an organization's reputation. Reputational risk management is a critical business practice to ensure that your organization is doing everything possible to minimize the potential damage to its character or value. Find Out How Security Ratings can Reduce Your Company's Risk. The BitSight Security Rating Platform gathers terabytes of data on daily security outcomes from hundreds of sensors deployed across the globe. All of the data is externally available and collected without any intrusive testing. Data is classified into several risk categories, including botnets, spam, malware, unsolicited communication, DDoS, and system configuration, and then mapped to an organization's known networks. BitSight’s sophisticated algorithms analyze the data for severity, frequency, duration, and confidence to create an overall rating of that organization’s security performance.